The Daily Deal for Tuesday, Feb. 5: Napoleon Bonaparte once said that "An army marches on its stomach." 200 years later, the words still hold true; a soldier can't wage war for long without a full stomach and a full ammo clip. Thank heavens for ThinkGeek's Marshmallow Assault Rifle, which manages to combine munitions and rations in one sweet package. This delicious weapon has two barrels: the bottom one shoots mini-marshmallows, which are handy for laying down a fine surpressing fire. While your enemies cower in fear of your mini morsels of terror, the top barrel can shoot its delicious payload of full-sized marshmallows up to twenty feet. Best of all, after the surrender, you and your opponent can discuss the terms of the armistice over s'mores. 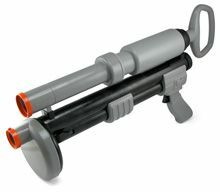 For a limited time, ThinkGeek is offering the Marshmallow Assault Rifle for $14.99, over 60% off its regular price of $39.99. When it comes to the field of honor, ThinkGeek has truly found a way to make war sweet!